People in Turkmenabat are selling their family possessions to make ends meet. 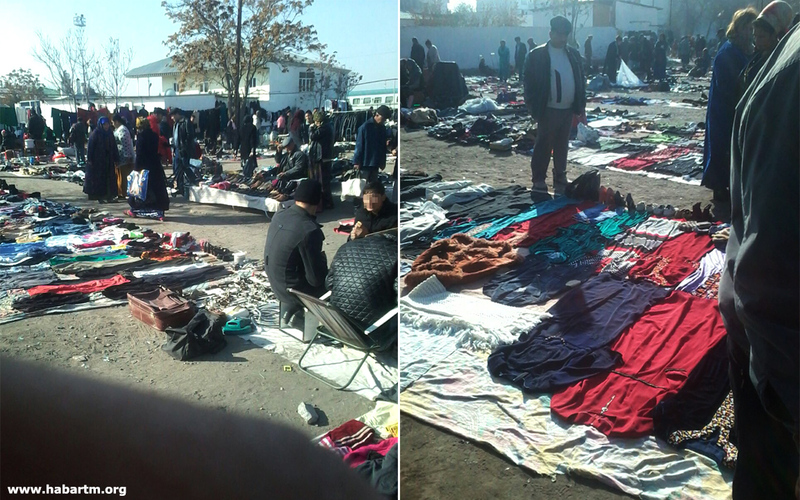 A correspondent for Alternative Turkmenistan News has visited a flea market in the center of town where second-hand dresses sell for 25 U.S. cents and shoes for a dollar. Just two years ago many families would not have contemplated selling off their clothes, but now, in what the government calls the Age of Might and Happiness, they have no alternative. 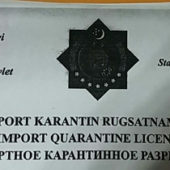 Many depend on remittances from relatives working abroad, as there are no jobs in Turkmenabat or the surrounding countryside. 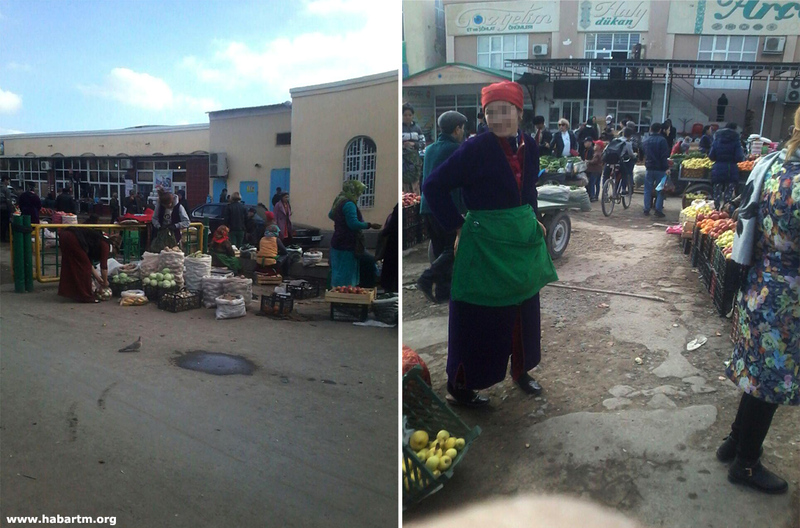 Selim Khaknepesov continues ATN’s series on life in Turkmenistan with this report from the eastern Lebap region. 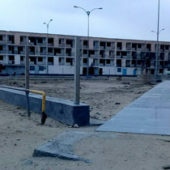 Turkmenabat’s impromptu flea market appeared right in the center of town near the Green Bazaar in the early 1990s, when Russians and people of other ethnic minority groups began to leave in droves. 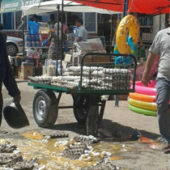 It became a favorite spot in this eastern region to get rid of things you didn’t need and earn a bit of cash before leaving for Russia, Kazakhstan or elsewhere. Later, when the flood of people leaving the country abated slightly, the market became the haunt of wholesale traders selling foodstuffs. The wholesalers are still there today, but they are getting pushed aside by the market’s original traders – people selling their second-hand goods. Everything has come full circle back to the 1990s, but with two caveats: today it’s not Russians selling their possessions, but local Turkmens and ethnic Uzbeks who have lived in these areas for centuries; and they are not selling their things because they are leaving, but because they have nothing to live on in the “Age of Might and Happiness” in Turkmenistan. Rustam, 60, born and raised in Turkmenabat, stretches out a plastic sheet on the ground, weighing it down at all four corners with large pebbles so the November wind doesn’t blow it away. 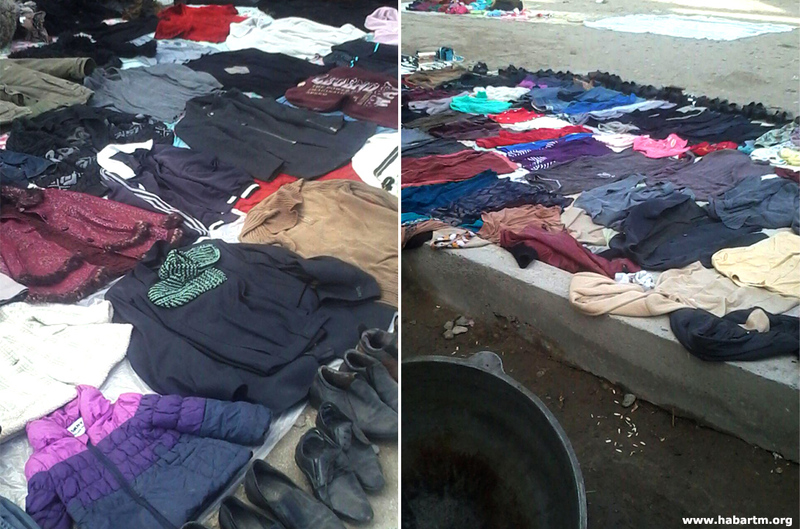 He neatly sets out his goods on the plastic sheet: women’s blouses and dresses faded from wear, washed out men’s polo necks, a track suit top with oily stains in places (he says the bottoms are completely worn out). In front of his simple stall Rustam places men’s shoes, boots and ankle boots. Some of the footwear doesn’t have laces, or insoles, the soles of one pair of shoes are cracked in two places. All the things belonged to members of his family. The teenagers’ clothes are too small now, but he doesn’t want to give them away to his relatives living in rural districts. He would rather sell them, however cheaply. But will anybody buy them? I hadn’t been planning to buy shoes, but mindful of the cold weather to come, I decide to haggle for some worn Turkmen knitted slippers and at the same time to get Rustam to open up. I take a walk through the flea market. You can get everything here! Old, push-button cellphones, batteries and chargers for them, a rusty Ural bicycle frame, a variety of empty jars, plates, chipped aluminum and wooden spoons with faded patterns, Chinese buckets and scoops with “new” copper wire handles, a battered brown suitcase – the kind my grandfather took with him on a work trip to Moscow when he was a young man. The only thing I would have bought out of all this junk is a large thick-cast aluminum pan but its bottom is burnt. Everything else should have long since been thrown in a garbage skip, but the shoppers, and there’s quite a few of them, don’t seem to think so. A middle-aged woman is holding a Turkmen dress against herself and trying to see what it looks like. She likes the price of five manats (around 25 U.S. cents), but isn’t so sure about the size. She leaves the dress and looks at other clothes. A young guy is counting out eight manats for an old jacket with threadbare lapels, having haggled the price down by two manats. He puts the jacket on straightaway under his coat, clearly two sizes too big for him, and leaves. A young woman puts on a pair of ankle boots with artificial fur for 10 manats in place of her jeweled summer flip-flops, which she had been wearing over knitted socks. Her flip-flops go straight into her carrier bag, ready for next season. This is business for some of the traders, Rustam explains, pointing towards a section of the market where a range of good-quality winter clothes are hanging on metal stands. These traders find people who are about to leave Turkmenistan for good and buy up clothes and household items wholesale for a song. They don’t have that many customers because a coat or overcoat for 100 manats is beyond the means of many. Some specialize only in furniture and domestic appliances, carpets, mattresses and bedding. 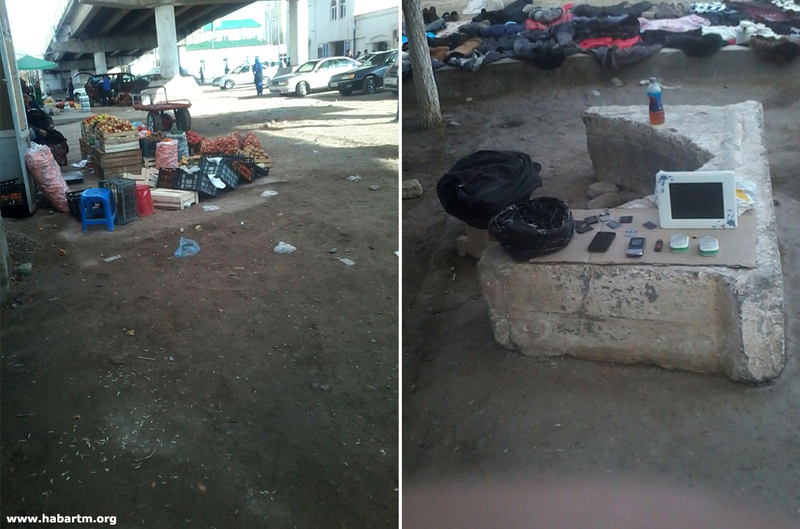 They trade in various places and at the flea market sell mainly clothes, footwear and small household items. It was his grandson’s illness that drove Rustam to the flea market. The schoolboy had what seemed to be an ordinary cold, but after 10 days it had got much worse, so his family hurried to different doctors. Just one packet of Viferon suppositories cost 400 manats, and they ended up over 2,000 manats in debt. The child did get better, but they’ve nothing to pay their debt with. At a family council they decided to sell their old things. They sorted through the storage cupboards, the old wardrobe, grandmother’s trunk and found plenty: crockery – teapots, drinking bowls, plates and saucepans – which they’ve already sold. They didn’t think they would have to part with the clothes and pieces of cloth set aside by his wife for their daughter’s dowry. But they had to. In early November their son’s wife went cotton picking three times, but her earnings weren’t enough to pay off the debt. That’s why they decided to try and sell some clothes and their daughter’s fabric. Rustam says there are a lot of families like them in Turkmenabat, struggling to make ends meet. There’s no work in the town and nothing at all in the country. Unemployed women and girls earn a little cleaning houses and child minding, but there aren’t that many families that can afford domestic help. The men work as taxi drivers or casual laborers – digging vegetable plots, unloading bricks, decorating. But even this work is becoming harder to find. I buy the second-hand slipper socks from Rustam at the asking price – two manats. It’s only two manats but he’s pleased. I’m not so mean as to haggle with him. I would give him more, but that might look suspicious. All the way back I have mixed feelings: on the one hand, I’m glad that people in Turkmenistan use old clothes, shoes and household goods a second time (and third and fourth!) which is less damaging to the environment. But on the other, what has happened to a country whose residents are forced to buy things that in other countries people would throw away without a second thought? Why are the citizens of a rich country literally taking off their clothes and selling them at the market for pennies? I don’t have the answers; perhaps the readers do. P.S. The ATN website has recently been coming under increased attack from unknown individuals or organizations. Our security system is constantly reporting dozens of unsanctioned attempts to access the admin system. The hackers used to try to hide behind questionable IP-addresses in Vietnam, the USA, Russia and elsewhere, but now it looks from the system data that they are going all out and not bothering to hide their real location – Turkmenistan, or to be more exact – Boldumsaz district in Dashoguz region. Our only enemies there are the secret services, so we think they are behind the attacks. We want to assure all our readers that we are well protected and will continue to raise the most pressing social subjects. Hi there. I heard that Turkmenistan is the «North Korea of Central Asia». I heard that they do not allow tourists to walk around unattended and it made me wonder what they are hiding. So, I did some research and came across your website. Thank you for publishing these articles in English. Most of what I’ve come across about Turkmenistan is just travel stuff. It does not sound like a good travel destination. There needs to be more information about Turkmenistan’s human rights abuses in the English-speaking media.